Quite often when people find themselves facing terrible and impossible thermal conditions within their homes they tend to blame practically every possible culprit, except for one. Your garage door could be letting air out of your home and making your HVAC unit work overtime trying to compensate. Aren't My Air Ducts Responsible For That? Yes, it is true. Quite often the majority of heating and cooling issues comes from your vents and HVAC unit. However, sometimes your ductwork can be in perfect working order and have nothing to do with it. Even minor gaps can slowly but steadily lead to hot air either escaping or entering your home, which will eventually lead to a higher energy bill, not to mention more frequent air duct/HVAC repairs. Why Is My Garage Door To Blame? Well, as you may or may not already know, your overhead door has an extremely great impact on the temperature inside your garage. Since most garages are not detached from the rest of their respective houses, air that ends up inside of this room can gradually seep out, or alternatively, seep in. For once, you could check the condition of your garage door weather seals and make sure none of them are getting too worn. If they are, you need to replace them with new material. Even minor tears and holes can compromise the thermal efficiency of your home. The best way to test your weatherstripping is to turn the light off inside your garage, close the door and check to see if any sunlight is coming through from outside. Even tiny pinpricks can be signs of wear and tear. Check both the bottom seal and the ones on the sides to be certain. Another thing that you can do is to have your door insulated. This is often considered during the buying process, but can also be performed after the door installation takes place. Either you get new insulation material inserted between the layers of panels, or, if you're feeling its time for a change anyway, you have the old panels replaced with new and improved ones that can offer you some other additional benefits. The choice isn't something you need to make on your own. 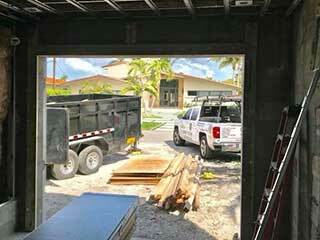 Please feel free to contact our team at Garage Door Repair Weston to consult with our experts.